We have your answers right here! What is Open Plan Systems? Based in Richmond, Virginia, Open Plan Systems strives to provide you with quality new manufactured office design options, but at a fraction of the cost of larger manufacturers. With our low panels, open or freestanding layouts, benching, tile or modular walls, our selection of classic and modern designs are sure to fit any office environment needs. With more than 25 years of office furniture industry experience, we are also a leading distributor of seating, storage and accessories, with dealers carrying our product lines throughout the country. We are passionate about keeping our customers satisfied by providing them with unparalleled service, quality and savings. Is Open Plan Systems a small, woman-owned business (SWaM)? What is your Signature Series? Our Signature Series features all-new product made to major manufacturer standards, but at value pricing. Choose from all six of our all-new systems options and select among our Grade 1 or Grade 2 finishes. Our Grade 2 finishes provide you the most variety and options, while our Grade 1 finish options provide you with the deepest savings. Whether choosing Grade 1 or Grade 2 finishes, our All-New Signature Series guarantees quality manufactured product at unbeatable savings! With our UL Listing and limited lifetime warranty, we ensure the same quality standards as major manufacturers but offer our all-new manufactured products at a fraction of the cost! Included under Signature Grade 1 are the following products: Razor System, OPS2 Panel System, OPS2 Tile System, Desking System and Modular Walls. Included under Signature Grade 2 are the following products: XPand System, Razor System, OPS2 Panel System, OPS2 Tile System, Desking System, Modular Walls and Powered Adjustable Height Tables. What program will my order fall under if I don’t have panels on the order? Since Pedestals, Lateral Files, Surfaces and Components are discounted at Signature Grade 1 pricing only when purchased with panels using Grade 1 finishes, it will fall under Signature Grade 2. What is your 7 Day Program? Our 7 Day Program offers a superior selection of systems, seating, storage and accessories at unbeatable price points and accelerated lead times. What class will the 7 Day Program fall under? The 7 Day Program ships product to you in just 7 business days, so it has a 7 day class. Does this replace your Quick Ship and Lightning Program? In order to simplify our programs, we have merged our Lightning and Quick Ship Program into one improved 7 Day Program with expanded options. Our 7 Day Program offers you a 7 Business Day quick turnaround but with more finish options than our previous Lightning Program and no panel width restrictions! We now have our 7 day Program, 3 week Signature Grade 1 and Grade 2 programs, and our 10 Week Program. What are the lead times for this program? Are you shipping outside of shipping lanes? The 7 Day Program lead time for systems and seating is seven business days. Day 1 counts the day after we receive the order. We prefer to stay in our ship lanes, but can ship outside of shipping lane if requested. Can you do custom items for the 7 Day Program? Ex, TT3072 cut to TT2872? No custom items or cuts are allowed for the 7 Day Program. The intention is to have all of the product in stock on the shelf ready to go. There are no exceptions for this program. Can I order individual components instead of full systems? No, individual components do not qualify for the 7 Day Program. Why would I buy the Desking System under the Signature Series if it is at a better discount under the 7 Day Program? 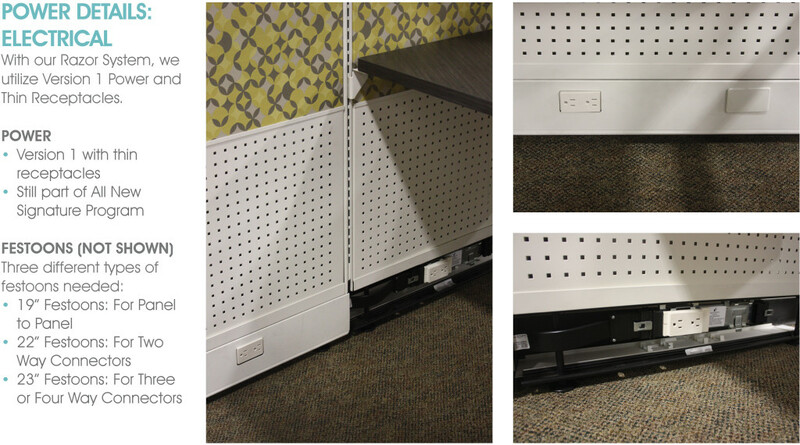 Since Desking is an in-stock product that we can pull off the shelf, it can be purchased through the 7 Day Program using the 7 Day Program finishes only. 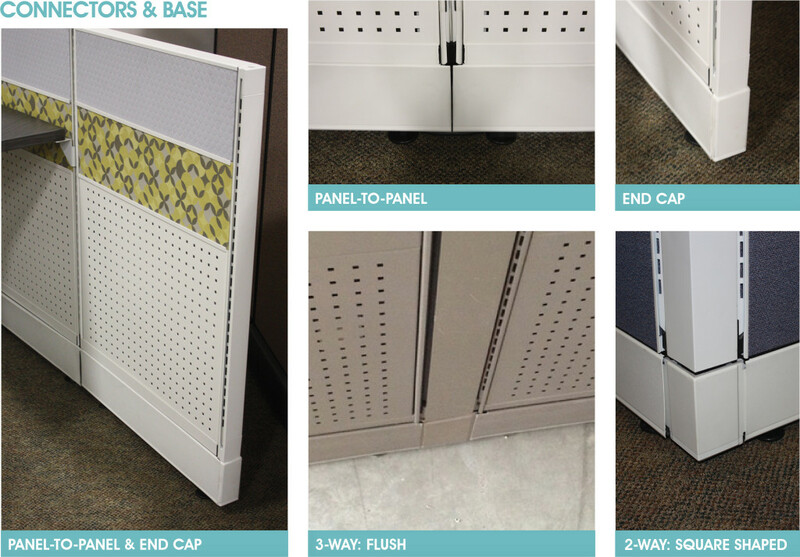 If you are combining the Desking System with the Panel System or non 7 Day Program finishes, then it needs to be purchased through the Signature Series. Can you provide an example of your 120 connector? What is the Sound Transmission Class for acoustic panels? The Sound Transmission Class, or STC, measures a panel’s ability to stop sound from being transmitted (through its core to the other side); an STC of at least 14 is good, with a rating of 23 or above representing optimal acoustical rating. The STC for acoustic panels is 27. What is the Noise Reduction Coefficient for acoustic panels? The Noise Reduction Coefficient, or NRC, measures a panels ability to absorb sound. An NRC of at least .65 represents a good acoustical rating. Our NRC for acoustic panels is .65. Are your tackable panels acoustic? Yes! Our tackable panels are now fully certified as acoustic panels! The NRC (Noise Reduction Coefficient) for tackable panels is .30. Note: Tackable Acoustic Panels utilize V2 rails. What are the specifications on your panels (thickness, etc)? The structural panel is fabric covered with a painted top cap, 14 gauge steel hanger frames, cable management side cover and adjustable glides. It is UL listed and has a Class A fire rating for both flame spread and smoke development. The powered panel has a factory installed electrical harness that distribute double-sided, 4 circuit power within a cable management raceway. Electrical components are UL listed. Once hardware is applied, the thickness is 2”. The top cap is either mold plastic or 25 gauge cold rolled steel. The panel core shall be corrugated, honeycombed paperboard. The frame shall be a top rail and bottom rail and stiles (uprights) of 2” timberstrand. The panel faces are glued to the front and back of the core and the frame and shall be a 1/8” medium density fiberboard. The 2 hanger rails, which for the vertical frame between panels hall be paint, 14gauge, cold rolled steel. They shall include slots at 1” increments for hanging components. Phillips head screws shall attach the hanger rails to the stiles. The 4 5/8” high, 3 ¼” deep base shall be a galvanized, 24 guage cold rolled steel base plate, 2 stell support posts and 2 cable management side covers of extruded, fire retardant PVC plastic. 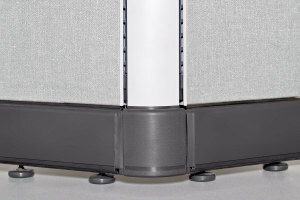 The support posts shall have grooved edges with the groove on the bottom hinging the side cover to the base and the groove on the top hooking the side cover under a plastic lip on the bottom of the panel. Side covers with receptacle locations shall have snap-in fillers. What options are there for desktop power and grommet placement? 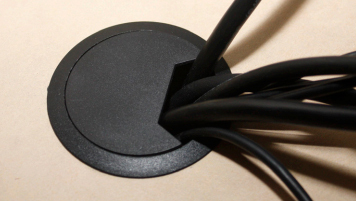 Click HERE to view all of our desktop power and grommet placement dimensions. What is the difference between V1 and V2 power? While there is no difference in the Power Entry Kit and the 4 circuit wiring in the PEK or ceiling feed, the power harness and connections in the panel base are completely different. On V1 power, the power harness runs almost the length of the base, with the receptacle locations at each end. To connect from one powered panel to an adjacent powered panel, a festoon is required. The festoons are completely separate from the harness and must be snapped into the ends of each power harness in the two panels. Our festoons come in two lengths, 19″ and 23″. The 19″ festoons connect straight running panels and panels at 90 degree angles. On power passing through 3 and 4 way connections, the 23″ festoon is required. NOTE: V1 rails the wedge block and slotted channel are always BU. On V2 power, the power harness is shorter and the receptacle locations are in the center of the panel. The flexible harness that connects the adjacent panels together is connected to the power harness. There are not any festoons required to connect the power from panel to panel. What are your V1 and V2 base and data punch out details/dimensions? VIEW OUR BASE & DATA PUNCH OUTS DETAILS AND MEASUREMENTS. What AMP is our receptacle? In keeping with the standards of the major OEM’s, Open Plan Systems’ receptacles are rated at 15 amps and the 8 Wire Harness is rated at 20 amps. The end with the exposed 8 wires will be hard-wired to the building electrical grid by an authorized, licensed electrician. 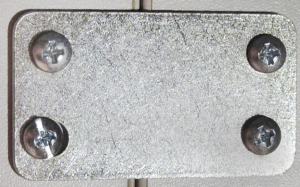 The end with an attachment should attach in the corresponding receptacle location of the first powered panel for based feeds or in the end of the harness for ceiling feeds. Are your base and ceiling feeds universal or are they handed (L or R)? What is the length of the power pole and ceiling feed? The pole itself is 141″ long. On OPS2 Panel System, there is a base cover that is 5″ which allows the poles to work on 12′ ceilings. This is on a 4×4 pole only. How many stations are there per circuit? 8 stations per circuit has been our general rule when designing work station pods. There are however exceptions. Analyzing how many amps a station is going to pull and comparing that number to the number of amps available will give you more accurate station to circuit numbers. How do we find amperage usage for a workstation? Review the UL label on all the fixtures that will be pulling electricity. This will give you the total amps the station will use. How much amperage is available per power entry? 4 circuits rated at 20 amps, then derated by 20% is equal to 64 amps. However, 64 amps will only be the number if the electrician wires each hot wire to its own breaker. If the electrician does not do this, but instead just ties A, B, and C to the same break and then attaches neutral 1 and group 1 (and capD, neutral 2 and ground 2), then there will only be 20 amps available for A, B, and C.
What is the D circuit? The D circuit is designed to be a dedicated circuit with its own neutral and ground (N2 and G2). This was important for computers 10 years ago, but is not utilized nearly as much currently. Can the D circuit share N1 and G1 with A, B, and C? Yes and no. D will not electrify without N2 and G2 so you could tie them to the shared neutral and ground post, but they must be attached. The receptacle is rated at 15 amps then derated by 20% to 12 (according to National Electrical Code). We also disperse our receptacles throughout the stations in an effort of level loading the power entry. Is there a maximum number of receptacles allowed per circuit? 13 duplexes per circuit is our general rule but there could be local code restrictions. What is the difference between V1 and V2 and rails? 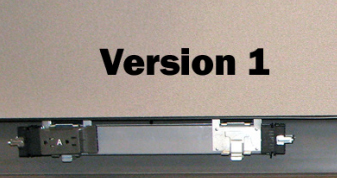 V1 actually identifies four distinct parts; the panel rail, the slotted channel, and a top and bottom wedge block, which reside on each side of the panel. V2 combines the two parts into one piece. The advantage is that panel height changes only require a factory supplied clip as opposed to a laborious in-field (or factory) hardware cut down. What is your Razor System? Our sleek Razor System creates a modern designer look at value pricing. Enjoy the flexibility of Razor Tile and Razor Panel options. Combine these options with desking, accessories, storage, seating or casegoods to create a chic, complete office design. The flush base and square connectors give an upscale design while maintaining a tight budget. Our Razor System is available with both our Signature Grade 1 or Grade 2 finishes. Are there separate part numbers for Razor System panels and connectors? Panels will have the same part numbers and will be noted as Razor System in the header of the quote. 2 way, 3 way and 4 way connectors will have new part numbers as noted below with a T.
Does the panel creep change with the Razor System? No, the panel creep is the same as our standard panels. Is your 20/20 library updated with Razor System symbols? Yes, Razor Panels have been added to our 2020 Giza and Cap libraries. What is the price of your Razor System panels? Our Razor System panels are priced the same as our standard panels. What program does the Razor System fall under? Our Razor System is available under our All New Signature Series. What type of power is used with the Razor System? When using our Razor System, V1 power must be used. What are the details of the Razor System connectors and base? How many Cat 5 cables can fit in the Razor base? We can fit up to 21 Cat 5 cables in the Razor base with power and 40 without power. What is your key alike process for storage locks? Click HERE to learn about our Key Alike process. Are the appropriate supports and bases included for counter caps, extended peninsulas and tables? No, they must be specified separately. How are the flat brackets calculated? Open Plan Systems supplies a flat bracket with each rectangle surface. When two corner or extended corner surfaces are joined together, an additional flat bracket needs to be specified. Do work surfaces come with cantilevers and hardware? All work surfaces, except for table tops starting with RT, SQ, RTC, RTCS, and TT are supplied with cantilevers, hardware and pre-drilled pilot holes. Cantilevers are painted to BU unless specified otherwise. What are the specifications on your work surfaces (thickness, etc)? This work surface hangs from a panel, wall strips, or the appropriate floor base supports and has predrilled holes for drawers and suspended pedestals. It is available primarily in 2 depths of 24” and 30” and approximately 23 widths. Custom dimensions are available upon request and as practical. The work surface has the option of either an HPL or LPL laminate top and 2 millimeter plastic edge. Attachment hardware is included. The work surface shall be 1 1/8” fiberboard core with either a high pressure laminate top face, laminate backer underside and rigid, extruded plastic edge or a melamine top face, melamine underside and rigid, extruded plastic edge. Holes shall be predrilled in the underside of the work surface for the installation of drawer and suspended pedestals. The work surface shall have a 7/8” gap at the rear to permit cord passage. Steel spacers and pins, for fitting the work surface onto the support arms, shall be factory installed to the underside of the work surface. The spacers shall be installed near the back of the work surface and shall fit into the teardrop holes in the supports. The pins shall be installed near the front of the work surface and shall fit into the round holes in the supports. 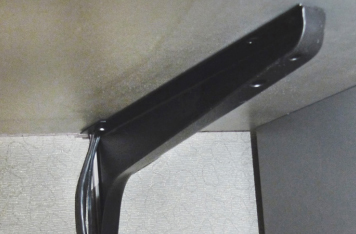 A galvanized steel, reinforcing bar shall be affixed to the underside of all work surfaces that are 60” or wider. It shall span the width of the surface and provide stability and prevent deflection. How do rush fees work? All rush requests must be approved by Operations. Once approval is received the shipment can be improved by one week, based on the lead time of the program, for an additional charge of 5% of the net price of the order. The minimum rush fee is $25.00. With the tile system, can I order perforated tiles on the outside of the panels and all fabric on the inside? CLICK TO VIEW OUR TILE SYSTEM GUIDE HERE. Where can I find pricing on parts? Call your Customer Service Representative. What is the difference between a grommet charge vs. us asking for a grommet that is not your standard size? Worksurfaces that already have a grommet specified have already received consideration for the inclusion of the grommet in the list price; regardless of size (within reason). 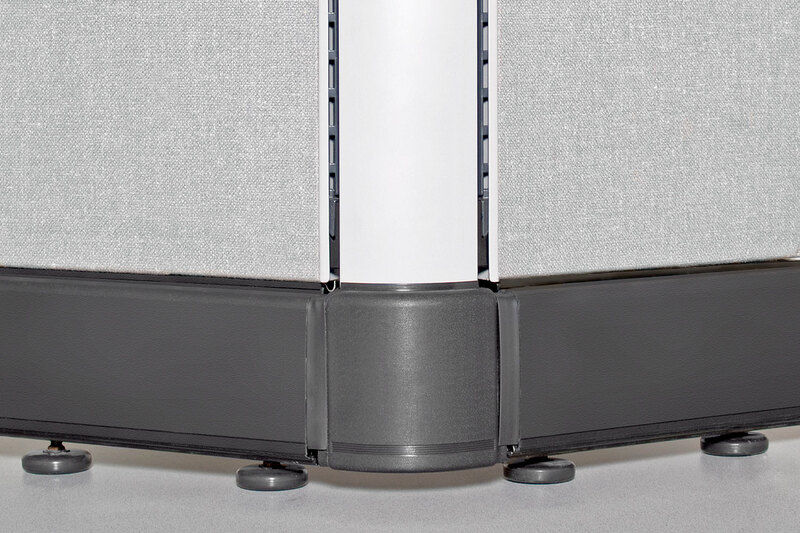 A grommet charge is appropriate for worksurfaces that never included grommet consideration in their list price. The worksurface color I picked is Grade 1 so why can’t I have that pricing or ship date if I don’t order panels? 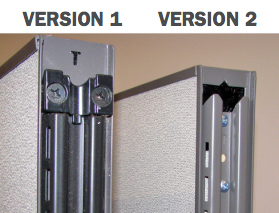 Open Plan Systems considers all workstation components when program discounts are determined. When a significant amount of the components are not included (or are included but in finishes that fall in another program) then the program may no longer be effective and Open Plan Systems reserves the right to move to the corresponding Signature program. If we already have a drawing and a spec sheet done outside of Open Plan’s Design Department, will Open Plan Systems do a spec check to ensure accuracy? If you specifically request us to check your drawing and spec sheet, we will send it to our design department to be checked. If you do not directly ask us to check your drawing and spec sheet, time may not allow for us to check what you have submitted. What is your design turnaround time? Standard lead time for most projects is 48 to 72 hours, although larger projects may require longer lead times. Please inquire for confirmation at the time of submitting your project. Dealer provides typical drawing, OPS design checklist and overall station layout. Design requests submitted by noon will be reviewed and entered into our design schedule log. A designer will be assigned and the project completion time estimated. A typical and design checklist will be returned with any questions. The design time will not be effective until the typical is approved and design information returned. It is the dealer’s responsibility to provide all necessary information to complete the design request. While every attempt is made to ensure the quality and accuracy of specification services provided, it is the responsibility of the dealer to verify that specifications are accurate and complete. Dealer has ultimate responsibility for accuracy and correctness of component counts, measurements, site dimensions and suitability of products and applications consistent with published guidelines and applicable codes. All plans, drawings and specifications are property of Open Plan Systems and may not be reproduced without written consent. The approval of a purchase order referencing specifications prepared by Open Plan Systems shall imply that the dealer has carefully reviewed the drawings and has approved all specifications as being accurate and complete. Open Plan Systems expressly denies any responsibility or liability associated with errors and/or inaccuracies in specification from the dealer. Do you do space planning? Open Plan Systems does not do space planning and provides drawings for the purpose of specifying product only. When designing in your product, when are turn panels required? For stability purposes, if overheads are not used, a turn panel is required every 12′. If overheads are used, a turn panel is required every 10′. Why do I need to complete a design checklist? Design checklists ensure that the Design Department has all the necessary details to accurately specify the corresponding project in a timely manner with minimal requests for clarification. Are cantilevers painted, the 20/20 library gives you the options? All cantilevers are painted to BU unless specified otherwise. Fabrics and finishes are not showing up in the 20/20 library, but are on your website. Which is accurate? If there is an inconsistency, please refer to our website instead of our 20/20 library. Although we do our best to maintain consistency, we are only able to update our 20/20 library approximately twice a year. We continuously update our website with our most current information whereas all new updates for 20/20 are made at one time. Do you have any guidelines for checking for damaged or missing items? Yes, we recommend you follow these GUIDELINES when checking over received product and reporting any damaged or missing product. Is the ship date the date the product starts shipping or arrival date? For local dealers, can you ship to arrive the same day? The ship date is the date that the corresponding order is gathered in the OPS shipping department, placed on a mode of transportation and departs for a destination. Open Plan Systems cannot ship to arrive same day but local dealers can make arrangements to pick-up after 2 p.m. of the corresponding ship date. What is transit time on shipment? This depends on the distance from the factory (in Richmond, Virginia) and current Interstate Freight Regulations. Customer Service can provide an estimate for specific arrival inquiries.